BRUSSELS (AP) — NATO’s foreign ministers ordered an end to civilian and military cooperation with Russia on Tuesday and told their generals and admirals to quickly figure out ways to better protect alliance members that feel threatened by Vladimir Putin’s Kremlin. The 28-member alliance, the keystone of U.S. and European security since the end of World War II, was reacting to its most serious crisis in years: Russia’s unilateral annexation of Ukraine’s Crimean Peninsula, which the U.S. and its allies have condemned as an illegal land grab. — The suspension of “all practical civilian and military cooperation” between NATO and Russia. NATO officials said ambassadorial-level contacts will remain open to assure a reliable channel of communication. — The possible deployment and reinforcement of military assets in eastern NATO members, such as Poland and the Baltic states, that feel menaced by Moscow’s latest actions. __ A possible increase of readiness levels for the NATO rapid response force. __ A possible review of NATO’s crisis response plans, as well as its military training and exercise schedules. NATO Supreme Commander Gen. Phil Breedlove and his subordinates will draw up the proposals within a few weeks and then submit them to political leaders for their approval, the NATO official said. To reassure alliance members closest to Russia and Ukraine, NATO already has stepped up air patrols over the Baltic Sea and AWACS surveillance flights over Poland and Romania. Prior to the meeting, the chief of the North Atlantic Treaty Organization downplayed reports of a Russian troop withdrawal from areas along its border with Ukraine. 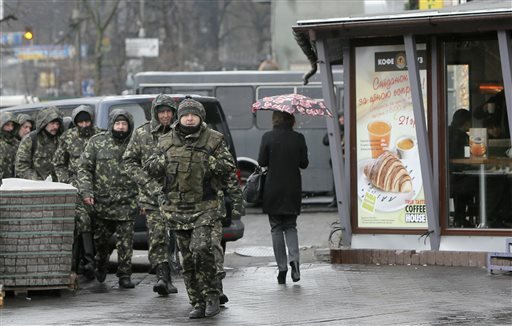 Russia’s Defense Ministry on Monday said one battalion — about 500 troops — had pulled back. Self-Defense activists pass by the Dnipro Hotel in Kiev, Ukraine, Tuesday, April 1, 2014. A tense standoff between Ukrainian police and a radical nationalist group Right Sector ended Tuesday, when its members surrendered their weapons and left a downtown hotel. 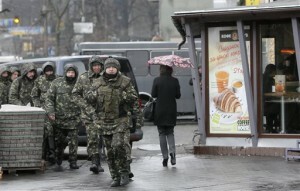 Their departure followed a shooting spree in the capital, in which a Right Sector member shot and wounded three people outside a restaurant adjacent to the capital’s main Independence Square, including a deputy mayor of the capital. German Chancellor Angela Merkel, speaking to reporters in Berlin, echoed those comments. An estimated 35,000 to 40,000 Russian troops equipped with tanks, other armored vehicles and fixed and rotary wing aircraft remained positioned near the border with Ukraine, a NATO military official told The Associated Press on Tuesday, speaking on condition of anonymity because of the sensitive nature of the information. The official described the Russian buildup as “a complete combat force” that was highly threatening to Ukraine. Ukraine’s foreign minister, who was meeting with his NATO counterparts, planned to speak to reporters later in the day. In other developments, Russia sharply hiked the price for natural gas to Ukraine and threatened to reclaim billions in previous discounts, raising the heat on Ukraine’s cash-strapped government. 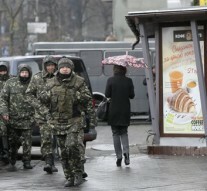 In Kiev, Ukrainian police moved to disarm members of a radical nationalist group after a shooting spree in the capital. German Foreign Minister Frank-Walter Steinmeier renewed a push for internationally backed direct talks between Russia and Ukraine. “What will be important in the coming days is getting Russia and Ukraine around a table together,” Steinmeier said at a meeting with his French and Polish counterparts in Weimar, Germany, before heading to Brussels. Alexei Miller, the head of Russia’s state-controlled Gazprom natural gas giant, said the company has withdrawn December’s discount that put the price of gas at $268.50 per 1,000 cubic meters and set the price Tuesday at $385.50 per 1,000 cubic meters for the second quarter. The move is expected to eventually hit Ukrainian consumers hard. Household gas prices in Ukraine are set to rise 50 percent beginning May 1. The Russian discount was part of a financial lifeline that Putin offered Ukraine’s previous president, Viktor Yanukovych, after his decision to ditch a pact with the European Union in favor of closer ties with Moscow. The move fueled three months of protests that sent Yanukovych fleeing to Russia in February. Also Tuesday, the Russian parliament annulled its deal with Ukraine to rent its Black Sea Fleet’s base in Crimea until 2042 for $98 million a year and discounts for Russian natural gas. Radical nationalist groups played a key role in Yanukovych’s ouster, but quickly fell out with the new government in Kiev. Many activists are still encamped on Kiev’s Independence Square, known as the Maidan, and have signaled their intent to remain until the May 25 presidential election. Last week, one of the leaders of the most prominent radical group, the Right Sector, was shot dead while resisting police. Right Sector members then besieged parliament for hours, demanding the resignation of Interior Minister Arsen Avakov. They lifted the blockade after lawmakers set up a panel to investigate the killing. Late Monday, a Right Sector member shot and wounded three people outside a restaurant adjacent to Independence Square, triggering a standoff that lasted overnight. Police responded by surrounding the Dnipro Hotel, which Right Sector had commandeered as its headquarters, demanding that the radicals lay down their weapons and leave. Avakov said Right Sector members agreed Tuesday to do so. The Ukrainian parliament then voted to order police to disarm all illegal armed units. Backers said the move was needed to combat a surge in violent crime and to defuse the risk of provocations by “foreign citizens” in Ukraine’s southern and eastern Russian-speaking regions, where some anti-government groups have rallied for secession. If police disarm nationalists and other radicals, it would undermine Russia’s allegation that the new Ukrainian government was kowtowing to those groups. Vladimir Isachenkov reported from Moscow. Peter Leonard in Kiev, David Rising in Berlin and Geir Moulson in Weimar, Germany contributed to this report.